Norwegian artist Marianne Heier is known for her politically-charged performance and installation works. While her practice has always been underpinned by anti-capitalist aims, she’s taken on a series of pertinent issues along the way, from the Norwegian oil boom’s dirty money to more recent examinations of the perils of the globalized textile industry and the refugee crisis. She recently presented a performance commissioned by the Kunsthall Oslo at a public library in Tøyen, interrogating the real conditions of migrants in Norway from personal accounts. We spoke to Heier about the inspiration behind this work, as well as her use of performance as a preferred medium for political statements. Alison Hugill: In your recent piece ‘The Ocean is Not Unfaithful’ you drew inspiration from your child’s personal reaction to stories of migrants and refugees, and the idea of perilous one-way travel. How did you come to this concept? Marianne Heier: Like most people I have felt shocked and helpless watching the news about migrants crossing the Mediterranean on board completely inadequate boats and even losing their lives in the attempt to reach the other side. The way Europe, the former colonial masters, have received these people, and the way they have systematically been described as ‘less’ than ‘us’ is simply shameful to watch. They are consciously or unconsciously seen as criminals, with no right to ambitions and with a duty to express everlasting gratitude just for being here, in a place they probably would never have chosen were it not because of the extremely unfair distribution of wealth and power in the world today. Marco Vaglieri, my partner, moved to Norway from Italy just before our child was born, and I have enough direct experience with the Norwegian machinery of ‘integration’ to know that the idea promoted by public discourse, the media and the politicians of immigration to Norway as an easy and smooth process is completely false. It is simply a lie. While migration is as old as humanity itself and must be seen as natural, the nation state with all its regulations is a construct. It is there to protect certain privileges, and to keep them from circulating outside the limits of a specific territory. The regulation of movement in order to control and limit access to resources is a strong capitalist impulse, of course, and the implications on people’s lives and bodies are violent. What we are actually watching is the construction of a new underclass with less rights than the rest of the population. Of course the self-image we have of Norway as a nation based on democracy and equal opportunities contrasts strongly with what is actually happening. When one of our friends from Italy was expelled from Norway because her Norwegian partner could not meet the requirements for a minimum yearly income to support her and their newborn child, we had to explain this to our daughter. Her reaction to this event was very strong, and in the performance she reads her own text about it. 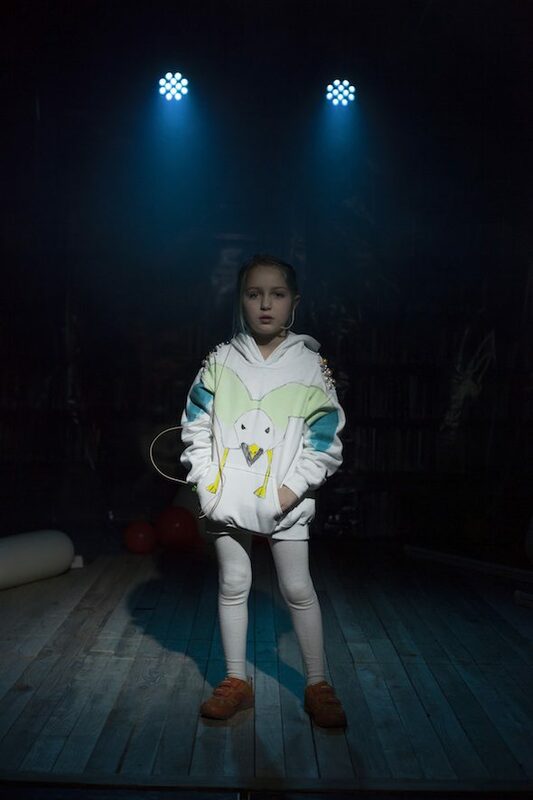 AH: How did you channel these impressions into the performance piece shown this month in Oslo? MH: When invited by Kunsthall Oslo to develop a project for the public library at Tøyen, a working class, multi-ethnic area in Oslo and also our own neighbourhood, it seemed like a good occasion to talk about migration from a different perspective: that of those with a first-hand experience of it. The library is popular in the local community, and functions as a meeting place for people from all over the world, representatives of different cultures, religions, classes and genders. They go there to hang out, and to consult the book collection. So the meetings are also between spoken word and written word, between history and our time, and between affirmed, celebrated tales and voices that generally go unheard. Since migration is a phenomenon as old as humanity itself, of course it is present in literature of all times. I picked bits and pieces from famous literature, both Norwegian and international, old and contemporary, and mixed them with tales of the users of the library. It is interesting how seamless it is, most of the time you really can’t tell if you are listening to a great writer or a migrant. My intent was to question the hierarchies determining which voices we listen to, whose perspectives are valuable and whose are not. The final work is a theatrical performance where two figures, Snake and Cheetah, meet on a beach after crossing the ocean, while Gull observes from above. The dialogue between the two main figures gives life to two contrasting, sometimes conflicting positions with regards to the experience of migration. Snake is thoughtful, with a deep intellectual and sensual connection to his roots, while Cheetah, ready to leave the past behind, represents ambition, speed and direction. 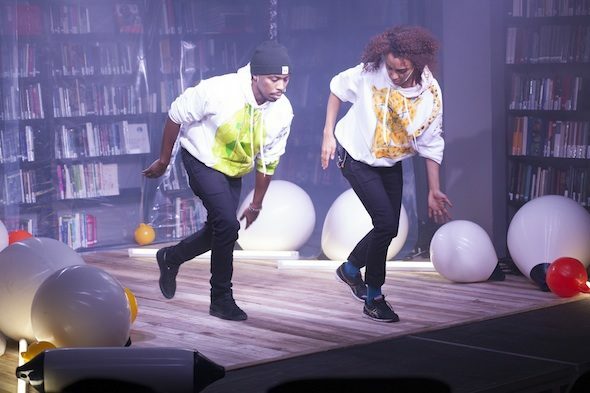 The piece, performed in the library, explores the tensions between these two temperaments in a play of equilibrium and conflicts. AH: You live and work as an artist in one of the richest countries in the world—having relatively recently accumulated wealth through oil—which is considered a desirable location for new migrants. How do you reflect the negative aspects of this Norwegian “new money” in your practice? MH: I am very aware of my privileges. As a Norwegian artist I can work without worrying that I might not meet the fancies of the art market. There is an enormous freedom in this, a true luxury most artists around the world can only dream of. Regardless of class and family background Norwegian artists are able to express themselves freely without fear of starvation, since the public funding system for the arts is still strong and quite generous here. But this is not ‘clean money’, of course. The ‘Norwegian miracle’ is linked to the petroleum findings in the North sea at the end of the sixties, an industry that has since branched out to countries such as Angola, Libya and Azerbadjan through very dubious connections. So even though you could get away with saying the resources here in Norway are relatively evenly distributed among the population, it is obvious that we are also a part of a bigger picture where, for instance, colonial history and capitalist interests play a huge part. I am very interested in how resources move, how and why they are regulated, so these questions are at the core of my practice. Since the system currently ruling the world is not the result of natural laws, it is obviously a construct resulting from a series of choices. Therefore it can also be rethought, questioned, challenged and changed. In my work I try to find little loopholes, forgotten or overlooked possibilities, short circuits and contradictions, and then I try to develop them and give them a body so they are manifest in the world, as true and concrete as their surroundings. AH: Why does performance feature as your preferred medium for political statements? MH: I just really like the performative format. I am always really scared before going on stage, but I still like the thrill of it: the physical presence in the moment, the feeling of risk, urgency and exposure, and the lack of control. How direct it is, and how incredibly charismatic and suggestive it can be when it succeeds (of course it can also be painfully embarrassing if it doesn’t, that’s part of the game). All art is slightly incompatible with market logic, but obviously this incompatibility is stronger for performances than for art objects. Performances live and die with their moment, what is left is documentation. If you repeat them, they will still always be unique moments as they will change with the circumstances. Even when the documentation is very well done and ends up circulating as an artwork in its own right, it is still just echoing a gesture, not replacing it. I like this implicit resistance, this incompatibility built into the format itself. And of course it can blend in with real life actions of demonstrations, manifestations and activist strategies of all kinds in a different, more direct way than most other artistic formats. Since many of my works are text based, I find the speech a natural and efficient form to present them to the audience. AH: In your recent piece ‘Mirage’ you use water as a common signifier across cultures and continents. What did it mean for you to install these water wells in such vastly different geopolitical contexts as Norway and Malawi? MH: ‘Mirage’ is a complex project, and I know it has confused some critics. It is a conceptual sculpture consisting of ten drinking water wells built according to the UNICEF manual for bore holes and topped with identical Afridev pumps. One well is installed in Norway at Gaular mountain, the other nine around Blantyre in Malawi. 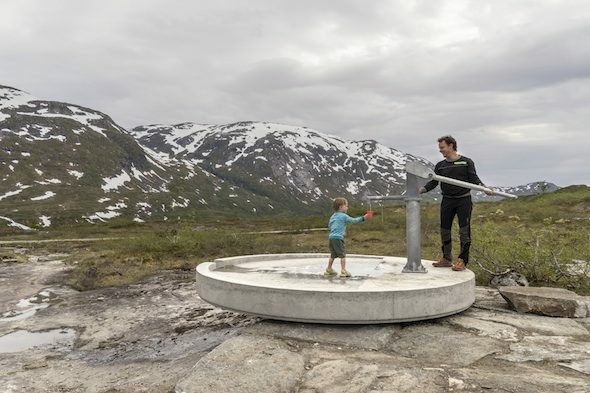 It is the answer to a commission from National tourist routes, a department of the Norwegian Public Roads Administration, who seeks to create touristic interest around Norwegian landscapes by installing art and architecture along selected stretches of roads. ‘Mirage’ challenges the Norwegian self image as a peace nation who deserved its wealth, ‘world champion in aid’ with a sublime, uncontaminated nature consisting of fiords, glaciers and mountains. People around the world mostly travel for other reasons than the desire to experience sublime nature, and in Norway not all travellers are welcome. In «Mirage» water, a resource over which wars are fought and for which many people travel far, becomes a symbol for resources in general and how they are distributed. The abundance of water in Norway contrasts the apparent lack of it in Malawi. All ten wells are functional, and I am happy to know «Mirage» in some small way can contribute to improving the lives for the local communities with whom I worked and who are the rightful owners of the wells. Their effort in building the wells is far bigger than mine or that of the National tourist routes. But what makes it an artwork and not an ordinary aid project is the one well installed in Norway. That’s where the rupture becomes visible. Placed absurdly in a landscape where there is no need for it, it raises the question of who gives what to whom, and of what returns to the giver. 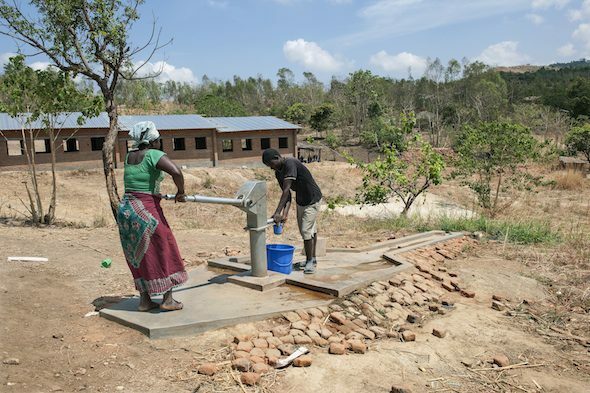 All ten wells are actually equally absurd; there is no real shortage of water in Malawi, just a shortage of infrastructure for its distribution due to its colonial past. All ten installations are equally at odds with their surroundings. But we are so used to seeing these aid structures in connection to representations of Africa that we mostly fail to recognise how artificial they really are. The real flux of resources is the one leaving the African continent and ending up in rich countries in Europe, mostly former colonial powers. The aid industry is just a thin layer covering this massive operation; the exploitation of the African continent is not finished yet, and both Norway and the aid industry play a part in this. Someone is benefiting from this injustice, and it is not the people in Malawi, for sure. ‘Mirage’ is an attempt to symbolically and concretely bridge this enormous conflict of interest. All owners of the wells are aware that this is an artwork connecting the ten wells together, and that whenever you operate one of the wells, there will likely be someone performing the same action somewhere else. Water knows no border, the same water flows through all of us, connecting us to each other and to the planet we live on. We all know what it feels like to be thirsty and what a relief it is to drink. ‘Mirage’ tries to establish a connection between the users of the wells based on what we have in common, while at the same time looking the colonial past and present in the eye.